Every child is unique and there are no rules concerning the beginning of teething, the duration or the intensity of the pain. It usually starts in the fourth month of a baby\'s life, although there are recorded cases of babies already born with teeth. Teething is usually an inherited process, so parents can expect their baby to start teething approximately at the age they themselves started getting teeth as infants. Humans have first and permanent teeth. A set of first teeth numbers twenty, whereas a set of permanent teeth numbers thirty-two. After it has started, teething can last until two or three years of age. These first teeth fall out completely at the age of twelve. First teeth that come out are central bottom incisors followed by the central top incisors. After they come out, other two incisor come out, only this time first top then bottom. Next in line are molars, followed by first molars and the process of teething ends with second molars. Teething symptoms differ from child to child. Some symptoms are the same as the symptoms of cold or other more serious conditions, so pediatricians rule them out as teething symptoms and insist on investigating them further. The most common symptom is irritability due to sharp pain a baby feels when a pointed tooth comes close to surface and starts poking its gums. This experience is usually the worst while the first tooth is coming out because the baby does not know how to cope with it, and while the molars are coming out because they are significantly bigger than other teeth. After a baby gets used to this pain, learns how to help herself with chewing teething pacifiers or anything that comes her way, the irritability will lessen or even disappear. Biting and chewing are also symptoms of teething which help a baby cope with the pain by relieving the pressure in the gums. Irritability caused by pain can manifest through cheek rubbing and ear pulling, usually when molars start coming out. Since ear pulling is a symptom of ear infection as well, parents should keep an eye on other symptoms their baby is showing. Another symptom of teething is drooling which can start a lot before the fist tooth comes out. Saliva helps babies cool down painful gums, and it is stimulated by teething. Next symptom, coughing, may be caused by the saliva. Although this is also sign of cold, if the baby shows no other signs of cold, parents should not panic. Another sign of the cold that might happen while teething is runny nose usually because babies put their hands in the mouth. If parents notice more symptoms of cold than one, they should notify their doctor. All babies are different, so some drool more than others. Those who drool a lot may develop a chin rash due to wetness caused by the saliva. Parents can prevent this by wiping their baby more often during the day. Almost all pediatricians disagree that diarrhea is a symptom of teething, but most parents admit their babies have different bowel movement while teething. Some explain it by excess saliva that is swallowed or by dirt baby gets from objects it gnaws, however parents should report this symptom to their pediatrician if they notice more than a couple of suspicious bowel movements. 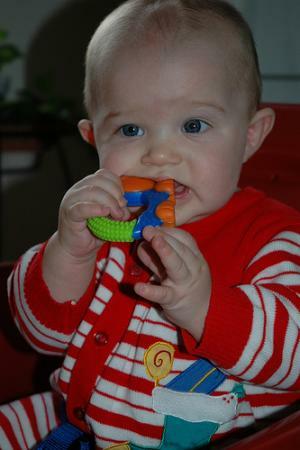 Parents can help their babies by giving them rubber teething toys or teething pain medicine after consulting a doctor. When I should start to clean my baby teeth?